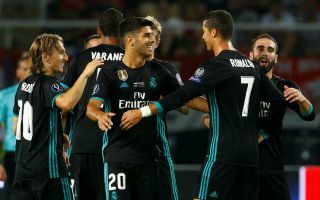 Chelsea and Liverpool are reportedly both in talks to seal the transfer of Real Madrid star Marco Asensio as he considers his future at the club. According to Diario Gol, Asensio is tempted to leave the Bernabeu, particularly if a big name like Eden Hazard is signed by Los Blancos in the summer. The Spanish outlet claims both Chelsea and Liverpool have been in touch with offers for the Spain international, who has long been regarded as one of the most exciting young players in Europe. Asensio could fit in perfectly at either club as they look to improve next season after being rather blown away by Manchester City this term. The 22-year-old would make a dream replacement for Philippe Coutinho at Anfield after his January departure to Barcelona, while Chelsea could of course do with a signing of his calibre if they do lose Hazard. Even if the Belgian stays, change is needed at Stamford Bridge and Asensio could be an ideal long-term replacement for ageing duo Pedro and Willian, though the latter is in fine form right now. Asensio has surely shown he merits more playing time at the top level and it is little surprise to see top Premier League clubs doing all they can to lure him away from Madrid. Don Balon recently linked Manchester City as admirers for Asensio as well, suggesting he was valued at as much as €150million.